Up, up, and, oh crap, UP! 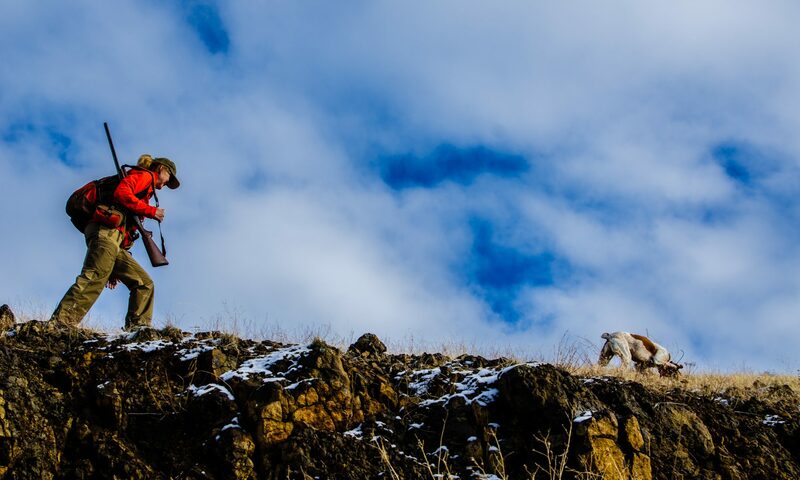 Well, after my recent post, “Getting High on Chukar,” in which I revealed that up north I have seen more birds lower on the slopes than I do down south, I went low over the Thanksgiving break in my spot down south. In other words, I decided to try the northern tactic in the south. It wasn’t the best day, but I have to remind myself that the worst day chukar hunting is better than the best day at work. I went with a friend. Conditions were pretty wet to start, which wasn’t bad and made the ground nice and pliable. 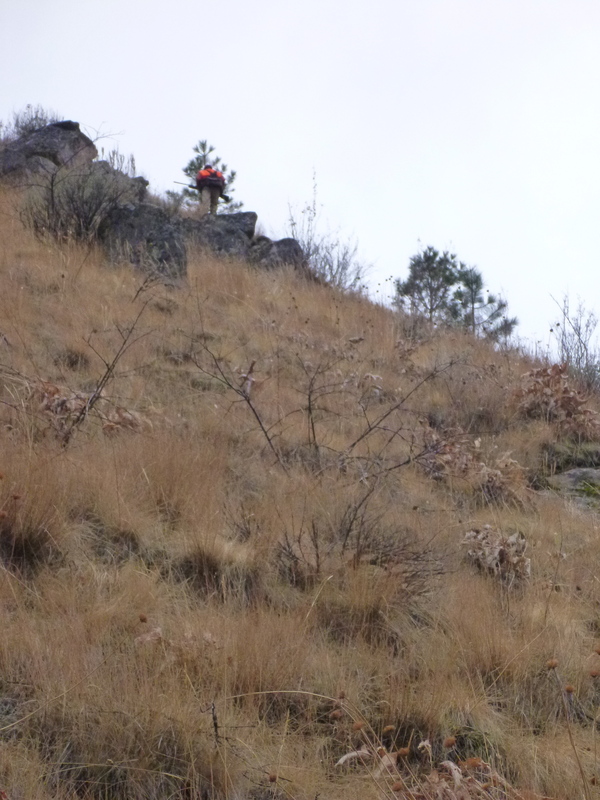 After about a half hour of steep side-hilling not far above the creek we came to a sharp ridge and draw, and I expected to see some birds there because of all the cover and the ridge protecting them from the wind. 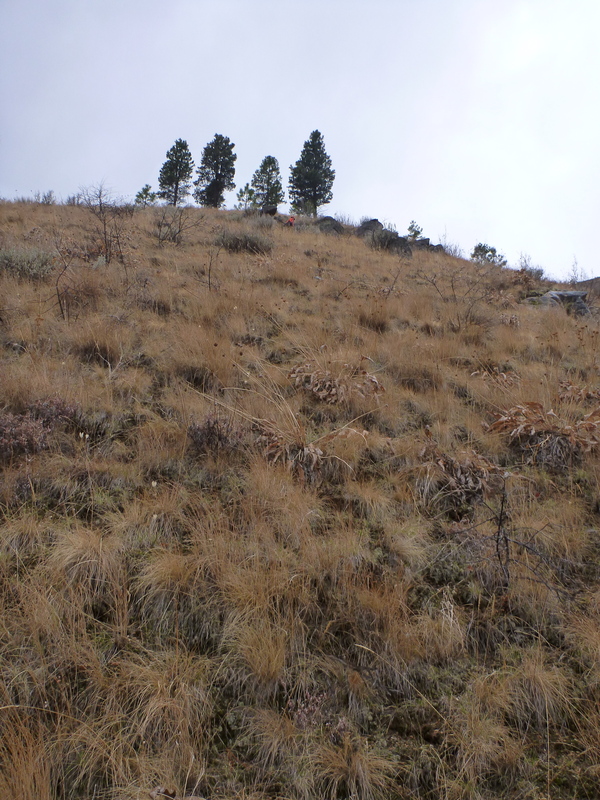 Sure enough, as we came over the spine of the ridge we saw Angus pointing downhill about ten yards below the ridgetop. Unfortunately, though, the birds busted before we could get in range. No shots, and about ten birds in the covey. It looked like they hugged the hillside and flared about two ridges away, so we skidaddled after them, paralleling each other on the hill about 75 yards apart, with Angus bouncing between us. After a couple ridges and some unpleasant brush-busting and minor falls, we’d bumped up two or three singles, and missed each of them. I felt we should get to a higher vantage point and work down, but the terrain was pretty imposing for such a feat so we continued at the lower trajectory. After a covey busted well above us, probably in response to our talking about what the hell we should do in the hardening rain, I decided to head straight uphill and head back to the truck. On the grueling way up I realized why I prefer getting high to start and working down. When you work low at first, there’s nowhere but up, and – Murphy’s Law or whatever – it’s usually the worst kind of “up” – rocky, loose, brush-encrusted, pitches requiring hands-and-knees ascending. Yuck. The fact that we didn’t see many birds throughout this ordeal was like a birthday boy watching his mom scrape all the frosting off his cake and run it down the disposal. Well, maybe not exactly like that, but sort of. Anyway, once we got up to the top ridge, the sun came out and the walking got easier. Still, we couldn’t find many birds up there, but at least I knew where I was. And, maybe best, the truck was below us. So, I’m not sure if I learned much on this day that I didn’t already know. I actually think the birds’ elevation is far more mysterious than “high” or “low” and depends on way more factors than I understand. Therefore, since I still know next to nothing about chukar behavior, I’ll continue “learning” by starting high and working down, especially if I can figure out which way the wind is blowing.